Comics Impulse v2: Marvel vs Capcom on PSN/Xbox Live? Marvel vs Capcom on PSN/Xbox Live? 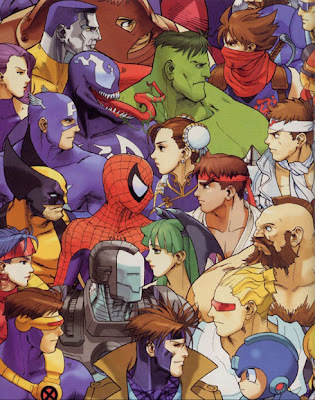 In an interview with Gamasutra, Marvel's VP of interactive media Justin Lambros says he hopes to see Marvel vs. Capcom make its way to digital download saying, "I'm a huge 2D fighting fan ... the Marvel vs. Capcom stuff has a definite close place in my heart, so we definitely wanna see that stuff live on." He says that there are no deals in place, but they may be considering it. If it's anything like Super Street Fighter II Turbo HD Remix, I'm all for it! Hopefully if it is eventually available for download, we might get these added features like online multiplayer like the Japanese DC version, new/remixed soundtrack and maybe even a few of the secret characters/bosses from the other games (like Evil Ryu, Cyber Akuma, Shadow Lady & Norimaro), add downloadable versions for ALL next gen consoles & it'd be perfect... Capcom are you listening?